There are as many “words of wisdom” on how to lay out a warehouse as there are warehouses. It shouldn’t come as a surprise. Maintaining a warehouse is a significant expense. And the consequences for laying out your warehouse improperly are steep. You lose time and money on each order, which adds up fast. And if you run out of space and need to look for more warehouse space, that’s a big expense. In other words: Using your warehouse space inefficiently has a serious detrimental effect on the bottom line of your business. But there’s a silver lining: The savings realized from a well-laid-out warehouse are just as evident on the balance sheet. There are big consequences for doing it wrong, and a big upside for those who know how to make the most of their warehouse space. 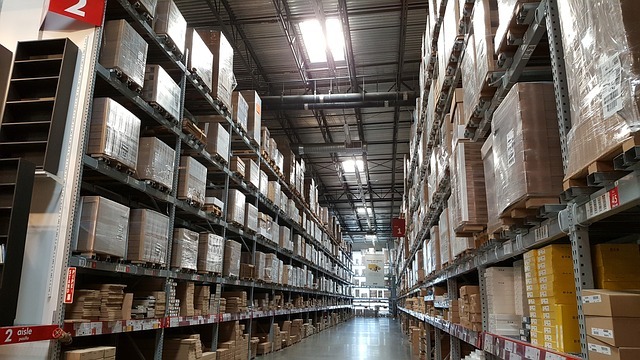 Here at Benco Industrial Equipment, we’ve got a demonstrated track record of helping companies in and around the St. Louis Metro Area maximize warehouse space and capitalize on the benefits with innovative warehouse racking solutions. Above we said that there’s no shortage of “tips and tricks” for improving the layout of your warehouse. Want to know the worst part? A large number of them are good advice! But where do you start? Casting about the internet too much will leave you with a list of more “solutions” than you can comprehend. That’s why we’ve done our best to give you seven pieces of solid advice that can get you going. When all you see in front of you are cramped corridors, look up! The space between your highest item and the ceiling of your warehouse is yours to use—and many aren’t taking advantage of it! Maximize your vertical space with new warehouse racks and you’ll be amazed at how much bigger your warehouse will seem. Loose items need a place to call their own, and that place is a container that you can store on a shelf. Many warehouses overlook the benefits that come from choosing containers that are a good fit for the item or items being stored. You may look out at your racks and see containers neatly organized with no wasted space, while inside, the container is far from full. Using containers of different sizes allows you to optimize in-container storage. While using all available space is key, it’s imperative that you use it wisely. One of the biggest mistakes we see is items getting “lost” because they’re trapped behind other items. Sometimes, this means it takes workers longer to find what they need. In other cases, they never find the item they’re searching you and you needlessly order more of something you already have. Keep items visible to avoid this problem. Okay, so you want to use all available space, but you don’t want to lose track of things. So how exactly do you do that? It all comes down to slotting related items together. Do certain items typically go together? Then why are they on opposite ends of your warehouse? Keep them together, and not only will they be easier to find, but it will take less time to assemble orders. That time is money, and that money belongs to you and your team. The best warehouse layout is useless if folks don’t know how to use it. Provide regular training on the importance of keeping the warehouse organized, and keep everyone up to date on warehouse changes and best practices. This helps build knowledge and make efficiency part of the culture. There are a number of systems out there that can help you and your staff quickly and easily keep up-to-the-minute records of how much inventory you have. Not only can you cut down on overstock, you can also identify opportunities for improvement. Invest in a system that makes sense to you and get started. Cutting down on overstock is key. Many warehouses keep “safety stock” on hand to keep from being sold out. It’s a principle that many households use—How many of you have extra toilet paper at home? But while a backup case of toilet paper is helpful, a closet full is just wasted space. The same applies to your warehouse. Find the right balance and you’ll be amazed at how much space you can open up. For new warehouse shelving and racking, and advice on how to make the most of the space you have at hand, call Benco Industrial Equipment at 636-486-1693.